The divers had just completed a dive and surfaced when two humpbacks leapt out of the water with mouths wide open, narrowly missing the humans. A cameraman on the divers’ boat captured the incident, and the video has accumulated more than 1 million views on YouTube. One of the divers, Shawn Stamback, said he thought he was going to get eaten or swatted by the tail. Neither of the divers suffered injuries, but Stamback cautioned against getting in the way of feeding whales. 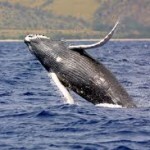 These whales can get as big as 50 feet and can weigh in at over 40 tons. These divers are very fortunate that they weren’t hurt. Humpbacks often travel in large groups so when you have a close encounter with one get out of the way because more of them are most likely close by. Hey Rudy, let’s dress up like seals and swim with the whales. I think the good people at Fish and Game will be using this video in a courtroom soon. Nearly a modern day tale of Jonah! Could it be that the Central Coast is taking on the appearance of Nineveh? I don’t see any SCUBA tanks? How close can divers get to whales? Aren’t folks supposed to stay a certain distance away from feeding/breaching whales? Got it, R.Hodin thank you. What an amazing experience, I WISH I could get in the water with a whale, it would top the experience of just getting close to them by other means. Encounters are amazing, they take my breath away and leave me in tears to watch them with their calves. To be in their presence makes me feel like time slows to its most precious pace. I wonder if I would foul my wetsuit? I would not call that a close call at all. They appear to be a good 5-6 feet away, at least. Sensationalism: so annoying. Yea that’s easy for you to say from the comfort of your home. I bet your attitude would be different if that was you in the water at such a close distance. Shawn does a great job and knows his business. SLODivers are great! I’m glad nobody got hurt and that he cautioned others about keeping their distance. Where are the scuba tanks??? No one had a scuba tank on. Strange!